The Congressional Budget Office has hit President Trump with a double whammy in its latest report, calculating that the U.S. budget deficit will surpass $1 trillion by 2020, two years sooner than previously estimated, as tax cuts and spending increases will do little to boost long-term economic growth. Spending will exceed revenue by $804 billion in the fiscal year ending Sept. 30, jumping from a projected $563 billion shortfall forecast in June, the non-partisan arm of Congress said in a report Monday. In fiscal 2019, the deficit will reach $981 billion, compared with an earlier projection of $689 billion. Deficits were only set to surpass the trillion-dollar level in fiscal 2022 under CBO’s report last June. The U.S. cumulative deficit -- taking into account the new tax and spending legislation -- will be $11.7 trillion from 2018 to 2027, about $1.6 trillion larger than the CBO projection in June. The CBO forecast 2 percent less revenue and 1 percent more spending over the period, it said. 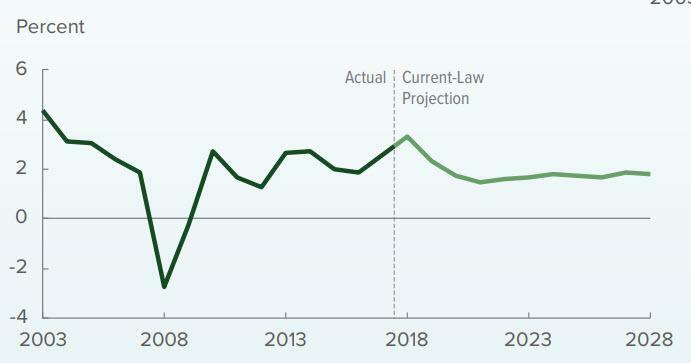 Over the 2021–2028 period, projected deficits average 4.9 percent of GDP; the only time since World War II when the average deficit has been so large over so many years was after the 2007–2009 recession. The tax-cut and spending legislation “provide fiscal stimulus, raising real GDP more than potential GDP in the near term,” the CBO said. As Bloomberg reports, the Trump administration has said tax cuts will lead to faster economic growth that would offset deficit expansion. 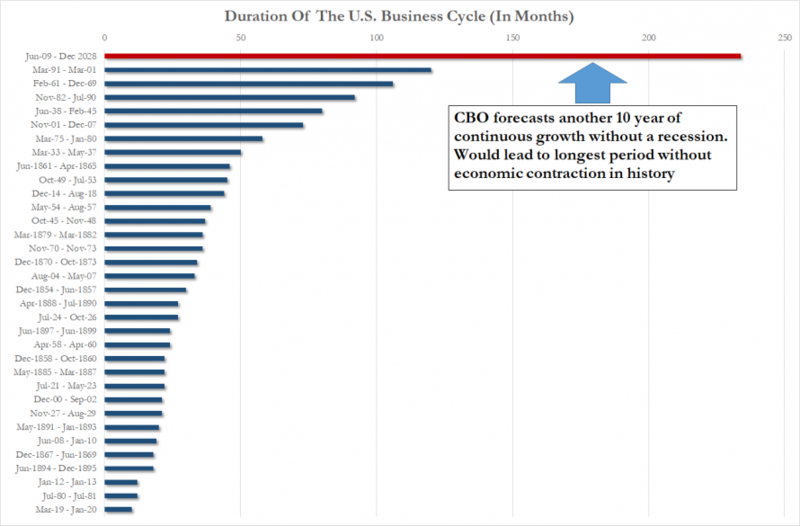 But, while CBO estimated that real gross domestic product will expand by 3.3 percent in the 2018 calendar year, they estimate that the economy will then slow to 2.4 percent in 2019 and 1.8 percent in 2020, based on the fourth quarter year-over-year figure. In June, CBO forecast 2 percent growth this year. 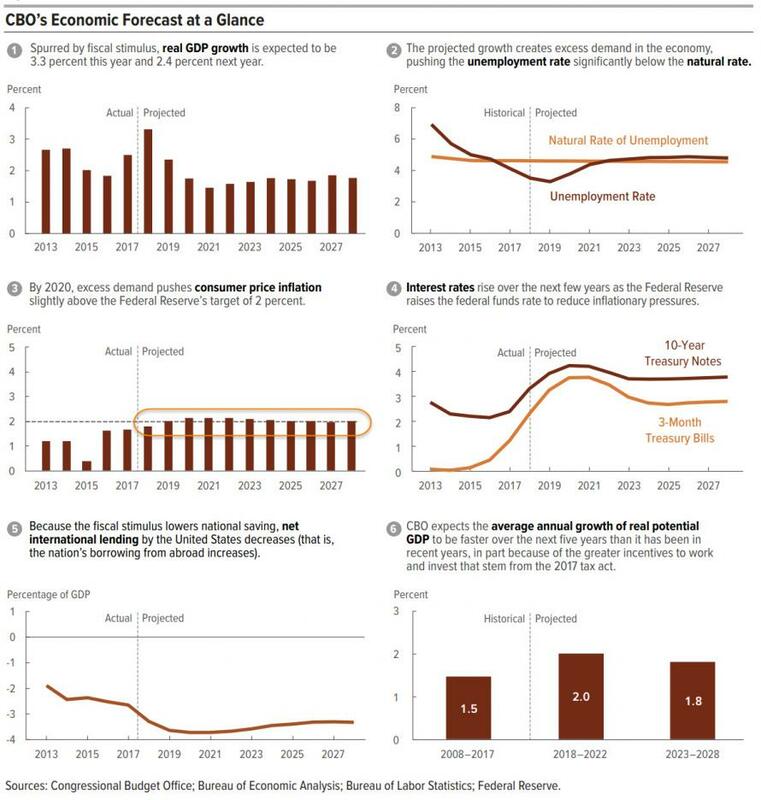 “During the 2020-2026 period, a number of factors dampen economic growth: higher interest rates and prices, slower growth in federal outlays, and the expiration of reductions in personal income tax rates,” CBO said. Finally, here is CBO's summary of its forecasts - note item 3 where inflation is set to remain stuck at 2% for the next 10 years... and unemployment will barely budge. As Bloomberg notes ominously, the CBO baseline represents what it projects will happen if current law is allowed to remain in effect. CBO assumes that budget caps on annual appropriations, which Congress has raised regularly, remain in effect. Because of that, deficits are likely to be even larger than CBO is projecting.